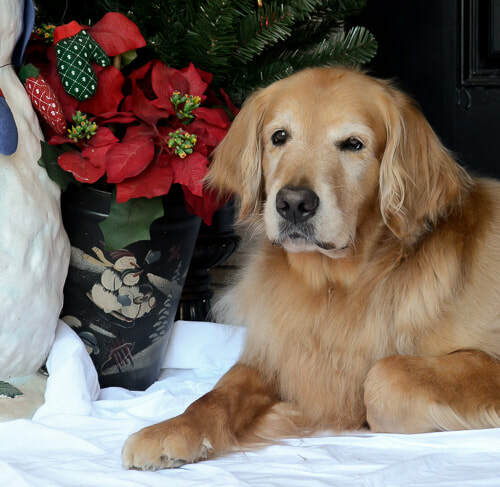 I am a Golden Retriever and I was born on May 7, 2009. My registered name is “PeKay’s Charm Offensive”, but my friends just call me Colbear….as in Stephen Colbert, the famous TV guy! Everyone says I am the calmest dog they have ever seen! While it doesn’t seem like I am excited on the outside, let me assure you I am wiggling with excitement on the inside. I know when I put on my vest that it’s time for lots of pets. I can stand, or lay, for hours as people love on me. I especially enjoy my readers as they lull me to sleep with the reading of a good book! I have achieved the titles of “AKC Canine Good Citizen” and the advanced title “AKC Community Canine”. This means I have been trained and tested to assure that I am a well-rounded member of society and I know how to be the perfect gentlemen out in public. I know lots of tricks, and enjoy showing them off. When I am not being a CAREing Paws ambassador, I enjoy doing Canine Nosework and other dog things! Hope to see you soon!